85% of teens and 72% of adults "thought washing your face more often helped clear up acne". So, don't over wash or over treat teen skin. Most teens are affected by acne at some level. Studies suggest that early onset acne in teens can most likely result in worsening of condition throughout the teen years. So, it is important for tweens and teens to gain control of acne early to prevent severe scarring. If there are no signs of acne in teens, do not over treat skin which causes unnecessary irritation and the "appearance" of acne. Teens' pores are still youthful, so keep the skin care methods pure and simple as to not start skin reactions that never needed to occur. Do not use overly fragranced products or complicated skin care regimens that can irritate teen pores. Make sure to protect skin when going outside and hydrate using pure and mild moisturizers. - Worst case teen acne usually persists into adulthood. Keep it Clean - wash all pillowcases, bedding and sports clothes often, clean your face cloth regularly and keep make up brushes washed and sanitized daily. Don't allow acne to spread with dirty deeds. Use a mild cleanser on face and affected skin only twice daily and refresh your skin by using a nourishing detoxifying spray toner at home and at school, after gym or tough days. 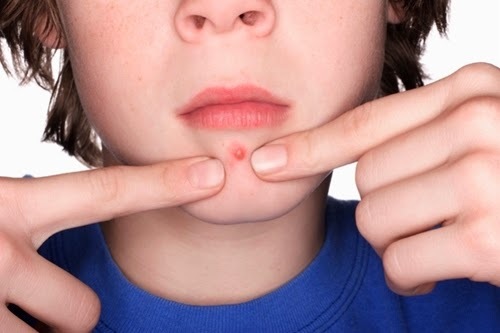 Don't pick or pop zits, this will cause more bacteria to spread in the area and worsen potential out breaks and also scarring. Wear less make up and use non comedogenic (non pore clogging) formulations. Let your skin breathe, go totally make up free for a few days - it's actually liberating! - Use clarifying serums and detoxifying toner to keep oil and sebum minimized and under control. - Only use gentle scrubs only when skin is not irritated. Slough away dead skin cells with a pure organic scrub that contains no harsh ingredients that can over dry or irritate acne prone skin. - Use a non comedogenic moisturizer with skin smoothing and clearing properties. In Your Face: Health and Beauty blog as well as mc2Beauty Inc. and Soyaskin is proud to be a contributor and sponsor for The Prom Show and www.ThePromShow.ca, a Canadian organization and online resource for teens and parents that has a strong message about youth advocacy and connects teens to everything needed for those special occasions that mark your adolescence. Visit www.ThePromShow.ca for more information.